“The digitizing of all these old papers,” JDS notes, “is really gonna transform traditional bibliography. For some authors, like M. P. Shiel, there isn’t much there, but for popular authors, like Louis Tracy, newspaper reprints were a big income source. Clode acted as his US agent and resold his novels as serials for decades after book publication, sometimes more than once to the same paper. Yeah, believe it or not, Louis Tracy — one of JDS’s main topics of research — was a hot name in his day. You can find many of his novels on Project Guttenberg, if curious. I am beginning to suspect that Hammett may have used newspaper reprints much the same way Tracy did, meaning there could be dozens upon dozens of newsprint appearances waiting to be found. Meanwhile, our frequent Guest Blogger Terry Zobeck couldn’t resist tracking down more info on the reprint of the classic Op yarn “Dead Yellow Women” that JDS spotted in the Ottawa Citizen. But then Terry noticed that the story carried a “copyright King Features Syndicate” tagline — “I’m thinking that it is taken from the version published in the 1930s and copyrighted by King Features. We’ve already seen that Dannay sometimes used their texts as sources for his editions, though he made changes to them as well. This thrilling mystery story was written before World War No. 2 at a time when Chinese patriots in America were doing their utmost to send aid to their countrymen valiantly fighting against Japanese aggression. point the Op is enlisting the aid of a Filipino laborer. In describing the man the Op says he could often be found ‘in a Chinese gambling house passing his money to the yellow brothers.’ In The Citizen’s version ‘he was passing his money over the tables.’ The Op then remarks, after the Filipino extends him a courtesy, ‘Whatever else the Spaniards do for the people they rule, they make them polite.’ This sentence is not to be found in The Citizen’s version. “Dannay’s 1947 version, by the way, follows the pure text, with only a couple of minor changes in the paragraphs I checked, so there goes my idea that he used the King Features version — unless it was the editor of the Ottawa Citizen who felt squeamish about the racial stereotyping. “I guess I need to find the 1930s King Features version of this story, to figure out if the cuts were made at the Citizen or not. of the remaining paragraphs are abridged — large chunks of Hammett’s prose are simply gone. Thanks, Terry, for the textual detective work. 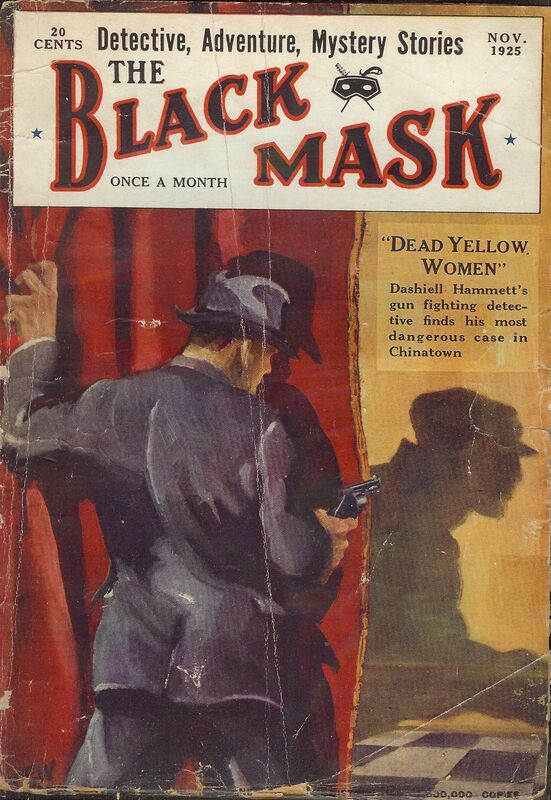 This entry was posted in Dash, Lit, News and tagged "Dead Yellow Women", "The Thin Man", Australian Women's Weekly, Black Mask, Crime Stories, Frederic Dannay, John D. Squires, Louis Tracy, M. P. Shiel, Ottawa Citizen, Richard Layman, Terry Zobeck. Bookmark the permalink.